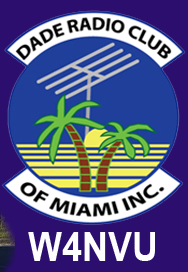 April 2012 Board Meeting Minutes – W4NVU – Dade Radio Club of Miami Inc.
Meeting was called to order at 08:30 with 8 present – Miguel, Virgil, Carl, Armando, Frank and Joanne in person and David and Ray appeared via phone. Corresponding Secretary – Virgil returned the mailbox key to Miguel and he will give it to Merritt. He also brought in the statements that he picked up the mail from the PO Box. Treasurer’s Report – Esther not present but she sent via text the amount in our savings and checking accounts. There is $26,262.00 total. Miguel went to the bank and added himself to the account as a signor. On the savings account, it is Ester and Miguel to sign and on the checking account it is Robert, Joanne, John Vehiccio, and Esther. Miguel sent John the papers to sign to have him removed from the account and he will also get the papers to Robert to sign to remove him from the account. In addition, Miguel applied for a new Visa card for the club for his signature. Once that is received, Robert will be removed from the account. So it should be Joanne, Esther and Miguel for the checking account and Ester and Miguel for the savings account. Web-Site – Ryan is not present this morning. Miguel has been working with him on getting the website updated. Club Elmer/PIO Officer is Frank. Frank was contacted by Killian High School as they want to set up a network station. Frank, Armando and Carl are working on setting us a station there. Miguel advised that Frank, Tom and he are all going to the Hamfest in Dayton to promote our Hamfest here in February. They have paid for their airfare themselves. They will be taking flyers and business cards to hand out. Armando spoke about having Amateur classes in June. Exact dates TBA. Information will be but on the State website, ARRL and our website. Miguel stated that Armando and Dave are doing an excellent job. Events – Field Day will be at Castillow Hammock Preserve and Nature Center located at 22301 SW 162 Avenue in Miami. Field Day is the weekend of June 23- 24. Gus has already paid $115.00 deposit and we need to reimburse him. He is coordinating everything. 147.000 – Miguel advised that parts were ordered and they came in. It should be up and running in the next couple of months. 51.660 – We are waiting to see if it is going to be removed. 444.200 – Carl advised it is up and working. D-Star – Michael Kelly, KJ4YDX, a new ham, is working at the UM Health Center. We might be able to put the D-Star there. Miguel already sent him a letter and is awaiting his response. We may also be able to put a 2-meter on the tower. Armando stated that Eddie from the Red Cross was looking into putting it on their building. Ray advised that the 147.240 is on one dorm and the $147.760 is on another. Ray needs access to fix it. It was discuss that Bob is near retirement and is not too friendly towards amateur radio. Scott is new and he will take over when Bob leaves and he is amateur radio friendly. Ray set him up with a radio. Mike Kelly is running a club at the health center and he wants a repeater. Ray will find out what campus he is at. It was discussed that someone put an antenna with no grounding on the JMH building and the whole site is at risk. Mike and Armando have contacts at the VA hospital. The club will work with Mike Kelly. Ray said that we need people at condos and in large business/commercial buildings for sites and we need to see if we can get some contacts. Emergency Committee Chair – Carl – stated that he is working on the ID’s and to remind him at least once a week. Miguel said he would. Armando spoke about the Red Cross. Our area Chapter now covers from Key West to Broward. There are 20 satellite stations around the Gulf and up the Atlantic that can be ready with 2 hour notice. They did a test yesterday. He needs a short crew to help life 50 lb boxes – about 4 volunteers. Hamfest was discussed. Tom Morris is working on the flyers and business cards to hand out. The website has been fixed and is up and running. Miguel, Tom and Frank will give out the flyers and business cards at Dayton and promote the club. Frank has put together a list of clubs in South America and the Caribbean. Our Hamfest is being sold as an “International Show”. The venue is secure at the Fairgrounds. They wanted a $5,000 deposit; $2,000 was already there and we paid the $3,000 balance a couple of months ago. The contracts are all signed. We have $18,188.00 budgeted for the Hamfest and incidentals. The cost for the venue and all facilities is $18,000. We have $26,000 in the bank. Hopefully, we will break even. We must sell 1500 tickets at $10.00 each. The price will be $10.00 in advance and $12.00 at the door. The club took in less than $800 last venue in 2008; $1500 at the last time at the Fairgrounds in 2006. This does not include vendor and swap tables at $50.00 each and $250.00 per booth. RV parking for vendors is $5.00 per night. We still need to get the pipes and drapes in blue and white. That is not in the quote. We will get a free list from ARRL for mail outs since it is a sanctioned Hamfest. We will discuss and finalize the ticket prices and approve them at the next meeting. Miguel stated that Robert will get to speak first on the subject. Mike from Mike’s Electronics said he would put up a poster for us. We need to print tickets, secure tables and spaces, we will use the same map as a guide from last time. When they get back from Dayton, they will have a better idea. We need to get the word out on the radio. Send out emails to the ARRL members on their list; the South American Clubs and the Clubs in the Caribbean Islands. Miguel would like to invite all EOC trucks to the show. It was discussed that we will need to buy out the concession stand. Gordon west announced our Hamfest at the next show and our website spiked. There is a lot of interest already. Ryan is working on setting up the Pay-Pal Account on the website to pay for tickets, tables, etc. Club polo shirts are available for $20.00 each in white or blue. See Miguel to purchase one. Miguel mentioned the list of all Miami-Dade Ares/Races Nets for the month. He needs info on the 805 American Net from Jose Vasquez for their Thursday night net. Ray spoke about all of the domain names and who is paying for what. Dave advised that some of them continue to be renewed and the money is taken out of our checking account automatically. Dave told Miguel to look at the checking account on the 1 & 1. He believes that it is $30.00 a month. The Hamboree websites (.net; .org and .com) are all being directed to Ryan. Armando discussed getting stickers for the back of laptops that are made of vinyl and are removable and are about 2” x 3” about the Hamfest so that we can hand them out and people will be reminded of the Hamfest when using their laptops. The Board Members will meet again on Saturday, August 11 at 9:30 AM. The DRC Board meeting was adjourned at 10:00.